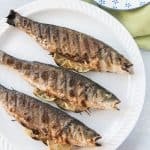 Branzini, Arctic Char, Red Snapper and Sea Bass all turn out amazing with this simple, rustic approach to grilled whole fish that is a healthy, wonderful dinner option for family or guests! Remove your fish from the fridge and let it stand at room temperature for 20 minutes. Rinse and pat dry with paper towels. Lightly drizzle the fish all over with the olive oil and season generously, inside and out, with the salt & freshly ground pepper. To properly season meat, don't get your hand too close when sprinkling seasoning on - if you pull your hand back a bit and sprinkle salt from a little higher up you will get more even coverage. Stuff the cavity of the fish with the lemon discs, garlic cloves, and thyme sprigs. Preheat the grill to medium-high heat and use tongs to brush the cleaned, preheated grill grates with an oil drenched paper towel. Carefully transfer the fish to the grill so the aromatics don't fall out and grill for 8-10 minutes over medium-high heat. Don't attempt to move the fish. When the first side is done, it will be lightly charred on the bottom and the skin will release easily from the grate. Flip the fish over and and grill until cooked through and the flesh is white throughout, about another 8-10 minutes. Carefully remove the fish from the grill and place on a platter to serve. Alternatively, you could cook this in a pan over medium-high heat with 2 tablespoons of olive oil. Sear skin side up for 3-4 minutes until lightly browned, then flip and cook until the fish flakes easily with a fork, 3-4 minutes more. Drizzle with a little lemon juice, if desired. Atlantic Char, Branzino, Red Snapper or Sea Bass are all good options for this approach. And you could easily swap out lemons for slices of lime or orange and thyme for cilantro or marjoram or parsley.